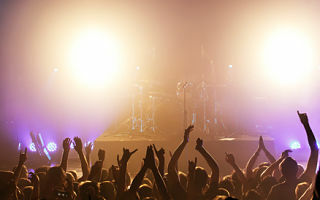 Does your auction crowd have the volume of a concert? Is your school auction crowd obnoxiously loud? Though any auction crowd has the potential for being deafening, the loudest auctions tend to be Catholic schools. The parents know each other so quickly find their friends to chat. And let’s be honest — Catholics aren’t timid about drinking alcohol, and that has a tendency to increase anyone’s personal volume when consumed in excess. No, I won’t be upset. But beyond that, I’ve learned that even when a client says their guests are loud, they aren’t that loud. More often, what the group perceives to be “loud” is average volume for an auction. Here’s an example of how this played out this spring in Cincinnati. When I arrived at the venue, I met the man who would be responsible for managing the sound system. In past years, he served as the emcee, making announcements about door prizes and assisting the previous auctioneer. “Interesting,” I thought, batting my false eyelashes. Bless his heart, he even went off to find me a glass and a knife. When I went back to the podium after taking a tour of the silent auction, the crowd-quieting weapons were waiting for me next to my bottled water. They gleamed like Excalibur’s sword, waiting for me to draw them when needed. I never used Excalibur; the glass remained quiet. All 450+ guests got perfectly quiet when I asked. Auction planners: I love you very much, but know this: If you believe you’ve got an unruly crowd, the issue is 90% the environment you’ve created — not your crowd. You are responsible for setting up the event to facilitate the goal (i.e. fundraising). With that in mind, let’s review strategies on managing crowd volume. Keep chairs close together. Guests should feel a bit crowded in the space. Offering theater seating is great for cocktail-style events (you can set up the rows for the auction and remove afterwards). If rounds are used, put 10-12 people at a table and/or keep tables a tad too tight. Yes, it makes it harder for servers. But if you’re at wits end on managing the crowd, something has to give. The auctioneer should be as close as possible to the crowd — “in” the crowd if needed. Consider a theater-in-the-round layout, especially for a guest count of 350+. Alternatively, put the auctioneer directly in front of the tables. There should be no dance floor separating the auctioneer from the crowd. Consider this: It’s hard to control an energetic youngster from 50′ away. It’s much easier to direct that child when you’re holding his hand. The same is true of an audience; proximity matters. Do teachers attend your event for free? If non-paying guests attend your event, assign them to the back corner tables where their disruptions will cause the fewest issues. One of my recent auctions had a two-story venue. Teachers were seated on the 2nd floor – smart! Here’s a prickly truth: At the majority of my auctions where drunks get out of hand and create noticeable distractions, it is the teachers (attending for free) who are causing the disruptions. This begs the question: Are you running a fundraiser or a teacher appreciation party? Maybe your school’s largest fundraiser isn’t the best place to simultaneously hold a teacher party. Are you running a reception-style event? Auctions can work in that environment for smaller groups, but when you have 300+ people wandering around in a large room with no reason or place to sit, you’re inviting problems. A higher ticket price generally means a quieter crowd. No free tickets. Some auctioneers have it; others don’t. It’s called charisma and it has nothing to do if one is female or male. A charismatic auctioneer can keep a crowd engaged (assuming you’ve done all this other stuff right). If something isn’t working, you may need to hire a better auctioneer. There is no getting around having a quality sound system designed for an auction environment. Yes, this will cost you money. Find a sponsor to underwrite it if the budget doesn’t allow for it. More than anything else, sound quality matters. A charismatic auctioneer doesn’t help your auction if he can’t be heard! If people can’t hear clearly, they won’t bid and will talk louder. It becomes a vicious cycle. I’m not a fan of open bars during the program. If this is a non-negotiable for your event, make sure those bars are in the same room as the auction but not easily visible. You want guests to be positioned to watch the auctioneer. One of my Catholic school auction team’s will pass drinks during the live auction. The bar closes, but volunteer Dads walk around with platters of beer, wine and water to hand out to guests during the live auction. It allows guests to remain in their seats but remain refreshed. Work with your auctioneer to create a realistic timeline. Then follow it. I’m not a fan of long speeches, long introductions, and lots of people on the podium. Personally, I’d rather most Catholic school auctions offer FEWER activities during their auction. Work with your auctioneer to figure out what’s reasonable for you. Every speaker on your stage needs to introduce the next speaker. There needs to be FLOW. That last bullet point — leadership on the stage — needs a more detailed explanation. I’ll do that now. Father prays. The crowd quiets down for this. A member of the school leadership (e.g. a principal, PTO President, Board chair) welcomes and thanks. Let me share more detailed talking points of how podium leadership should work, using the flow just described. Father leads prayer, then introduces the School Leadership speaker. The crowd is led in clapping (a la “welcoming”) the co-chairs to the stage. No down time is allowed. Tip: Be classy. Give a small gift to the Auction Chairs. Show the crowd you appreciate your volunteers. Ned and Nellie Jones, the Auction Chairs, speak. They might ask their committee to stand. They might say why they love the school. They might tell a personal story. Earlier this year, one Auction Chair in Milwaukee gave a touching personal story about a conversation she had with her young son as they left his Catholic school and drove past the public school. It was a simple way to connect the crowd to their Catholic faith and it explained why she and her husband chose to pay tuition to send their kids to Catholic school. The Auction Chairs then introduce the Auctioneer. One idea: Have the Auction Chair explain why they are working with *that* auctioneer, especially if you think there might be a backlash. Case in point, I was called over to speak with a guest who asked me, “I was just told you flew in from Washington, D.C. You mean they couldn’t find an auctioneer in Kentucky to work this event?” These comments don’t bother me as I’m comfortable bullshitting (in a highly professional way, of course) with guests. And certainly that gentlemen was OK with it as he turned out to be my second highest bidder. But some groups might want to mitigate problems by introducing the auctioneer with a proper introduction. You know your crowd best. The Auctioneer begins, using whatever tricks he’s developed to manage the crowd. Do you see how that flows? Father walks off stage without seguing to the next speaker. Even worse, he concludes with “Have fun! Bid high!” which is a verbal cue to the crowd to resume talking. The next speaker then must quiet the crowd, perhaps using a water glass and a knife. Then — God as my witness — he says the SAME THING when he concludes his remarks. The audience once again is cued to talk. The Auction Co-Chairs ascend the stage and try to quiet the crowd to make their remarks. In short order, the audience becomes annoyed. They’ve been quieted multiple times and the auction hasn’t even begun. You are treating them like children, and damn you — they PAID to attend this fundraiser and THEY AREN’T HAVING FUN. If you spend two minutes during your silent auction to coordinate your speakers talking points, much of this awkwardness is eliminated. Educate each speaker in how they can provide some podium leadership by seguing to the next speaker by leading the audience in applause. If you fail to provide podium leadership for your event, guests will assume it’s a free for all. No leadership = auction anarchy. Auction anarchy = unruly loud auction crowd. All these strategies will help to mitigate the disruptiveness of a loud crowd. Try them out at your next event. This is a great article/blog post. Thanks, Sherry. It is also very timely. I am having my first live and silent auction (since I became a Fundraiser) on Friday! Perfect timing! I am printing this and sharing it with my auctioneer and my committee. Glad it was helpful! I hope your auction went better than expected. First time events go by in a blur …. evening. I have experienced all the nightmares you describe. Will be taking each suggestion seriously and doing due diligence to ensure the program is smooth, enjoyable and profitable from start to finish! Great! I’d suggest we talk in more detail about this, too, Diane. Sherry I love your newsletter. Thanks for these and other great tips. I have chaired auctions for community groups, a middle school an two faith communities for the past 30 yesrs and I am still learning. Patty, I’m so sorry about the delay in responding to you. I’ve got a new website structure that I’m learning and I overlooked your comment. So glad to hear you are getting great tidbits from the newsletter! Auctions aren’t easy. They can raise a lot of money, but it’s not without effort. That’s why I still find myself finding new content to share after a decade of being in business. With all your community involvement, I suspect you realize as much, too.